Fiji Roads Authority (FRA) confirms that the Talele Bridge on Baulevu Road will undergo maintenance resulting in the temporary closure of the bridge at night on Wednesday 11th January. FRA’s contractor will begin work at 8pm tonight and the Talele Bridge will reopen at 4am tomorrow morning. Bridge closure signs have been posted in advance of the closure period to advice motorists in the area. 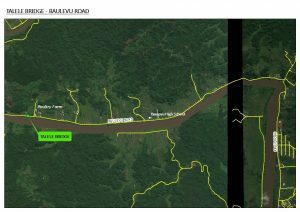 As a result, communities living along Baulevu Road beyond the Ram Sami Poultry farm and onwards to Baulevu landing including the villages of Naganivatu, Nakini, Natoaika and Deladamanu are requested to plan their travel accordingly as access is prohibited across the bridge during this period. Image1: Aerial view of the Talele Bridge location.